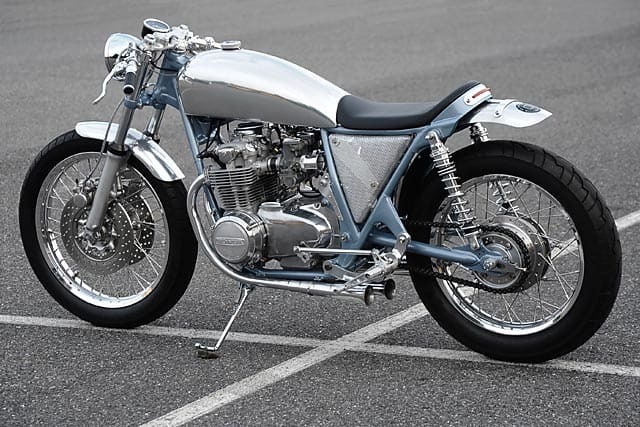 Some times there is a Cool Motorcycle that has been redesigned and contoured into something of beauty, and if seen, would make you stop in your tracks, I have seen many creations made here and over sea’s and when I saw this CB500, you had no choice but stop and admire the countless hours of perpetration and grazed knuckles to get something as aesthetic as this Machine named- The Bikini. By Kyril Dambuleff of New Jersey. Today I wanted to feature this ride as being a Motorcycle builder myself, I can see the hours put into this and it sure turned out really well, no way you cannot appreciate the time and effort that has gone into this ride, the amount of scraps of paper with ideas on, the Sharpie idea’s scribbled on the work bench when Inspiration suddenly dawns upon you- the array of coffee cups – crushed beer and soda cans that kept you going where others gave up- the snippets of electrical wire and heat shrink for those frustrating electrical issues- And finally – An empty space on your Motorcycle Table!! 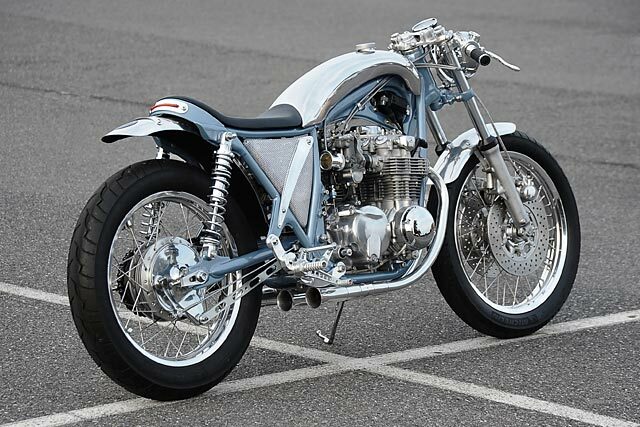 This motorcycle is the antithesis of the LOTUS C-01. Conceptually, of course. 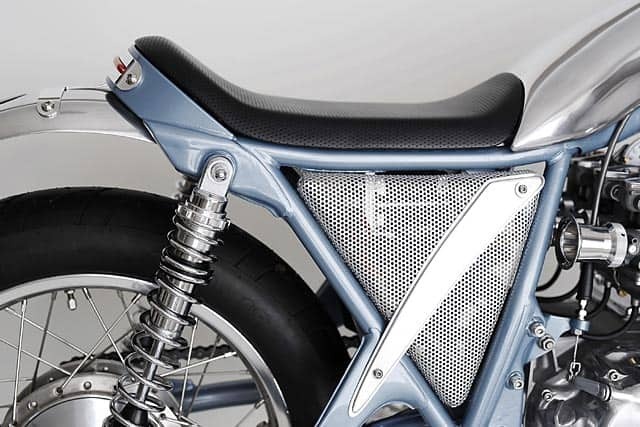 When looking at Daniel Simon’s design, there isn’t much you could see other than the motorcycle’s gorgeous overall shape. Most of the components are completely hidden from view. Here, on this motorcycle, just about everything is in full view. Like a “skeleton watch”. Those bare-bones timepieces in which the watchmaker has left only what is essential and revealed as much as possible of what makes a watch tick. Since I’m not too crazy about skeletonized watches, I prefer a different analogy: a tall, skinny, platinum-blond fashion model scantily clad in sky-blue bikini. Where everything is in full view except the little that is hidden and subject to the imagination. Hence the bike’s name: BIKINI. Well, not much. Unless it’s nestled in a bike trimmed to perfection like this beauty. So Kyril went about accumulating all the parts over the coming months – the frame, wheels, exhaust pipes, forks and tyres and all the other sundries that come from assembling a ground-up bike. But the focus was to remain the powerplant. It’s a little like that, but Kyril has an alternate slant on the bike. ‘But I prefer to think of the bike as a tall, skinny, platinum blonde fashion model scantily clad in a sky blue bikini. Where everything is in full view except the little that is hidden and subject to the imagination. That’s where I got the name from.’ As much as I prefer the name ‘Blue Balls’ I’ll grant him that ‘Bikini’ has a much classier ring to it. Kyril fabricated the aluminum tank himself, which slopes up hard on the right hand side to expose the spark plug leads and the coil. On the left it retains something close to the original lines but that completely asymmetrical design is certainly something I haven’t seen before. It’s also interesting to note the finish used on the exhaust headers. It’s not polished stainless steel but Cerakote applied with a mirror finish. Cerakote is actually a polymer-ceramic coating that’s usually applied to firearms – often in camouflage or flat earthen colors. It’s a neat process that’s very heat and distortion resistant and should ensure a mirror-like finish for years. 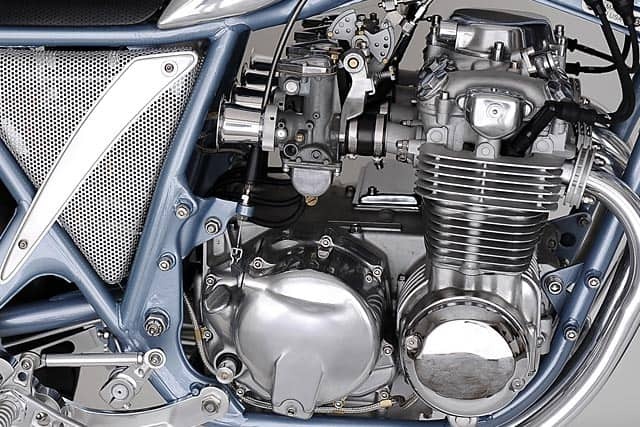 Those headers were fitted to the rebuilt CB550 engine – and unlike the frame, and maybe like it’s bikini-model namesake, many of it’s best features aren’t visible. While the engine was blasted and polished the cylinder was bored out to 59mm and new Wiseco pistons installed. Compression was taken up to 10:1 and displacement is now 553cc’s. 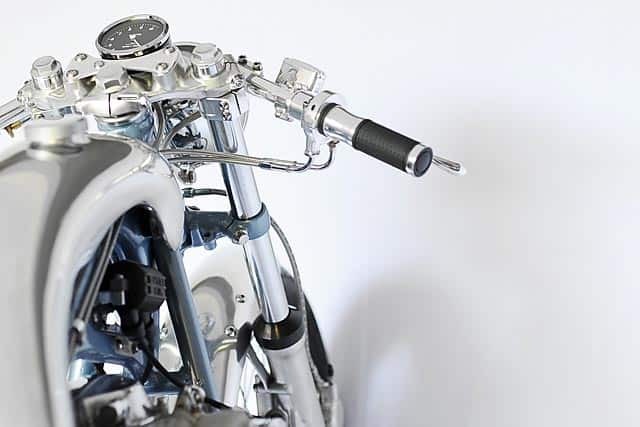 All told the bike is an incredible twist on the traditional cafe racer – and like an original caff this one is considerably lighter than stock. Kyril’s target weight was 350 pounds (158kg) and with the antigravity battery, aluminum parts and tricky things like the adjustable foot peg positioner he nearly managed to hit that with the bike weighing in at 357lbs. ‘I think I could have hit 350,’ he explains, ‘but I had to replace the front single disc with a twin disc setup that was irresistible’. More from the Builder. Kyril Dambuleff New Jerseys Finest Motorcycle Builder. 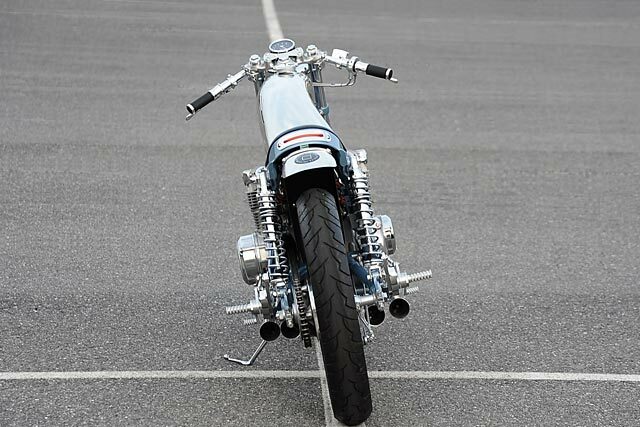 It all started with a HONDA CB550 engine, which I’d bought a year earlier and which I’d rebuilt completely from the ground up with the idea of keeping it as a spare for the BLACKSQUARE bike. Then, the rebuilt and detailed engine sat on my workbench for months taking up much needed space. I thought I’d display it somewhere somehow, perhaps in my office, and what could be a better “cradle” for it than an original frame? So, I bought a frame. And then, I bought a set of carburetors. 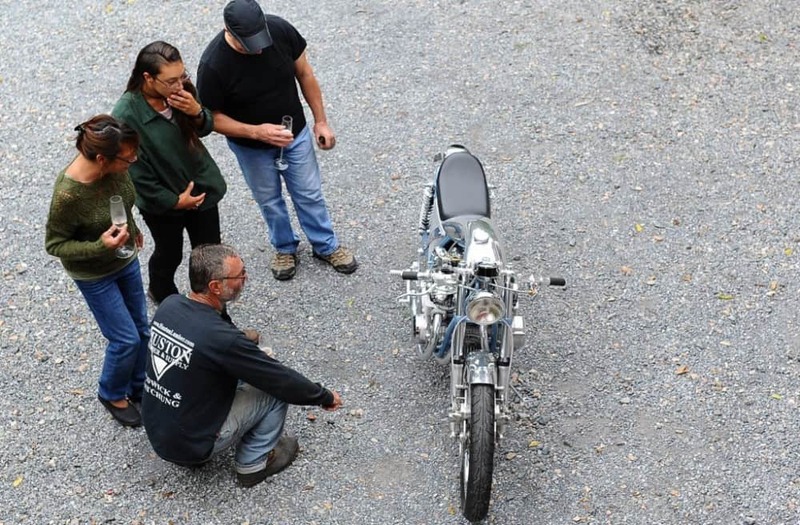 And then… it occurred to me that one way to display an engine is to build a whole motorcycle around it. One thing led to another. The principal idea to showcase the engine itself called for everything else to conform accordingly. So, by extension, almost everything else had to be fully exposed too, perfect as I can make it and as simple as possible. I personally benefit from having a “guiding principle” when working on a project. It makes life easier as it eliminates “what-if’s” and “should I or shouldn’t I”. So, when the concept of showing what makes a motorcycle tick dictated shaving off the majority of the right side of the tank, off that portion went. It didn’t bother me that, consequently, the tank became fully asymmetrical and that seemingly people just don’t do that (motorcycle tanks are always fully symmetrical). It had to be done and so it was done. A lot of the rest of the bike is, of course, conventional. It is a motorcycle after all. And it is a fully functional, street-legal and registered bike. 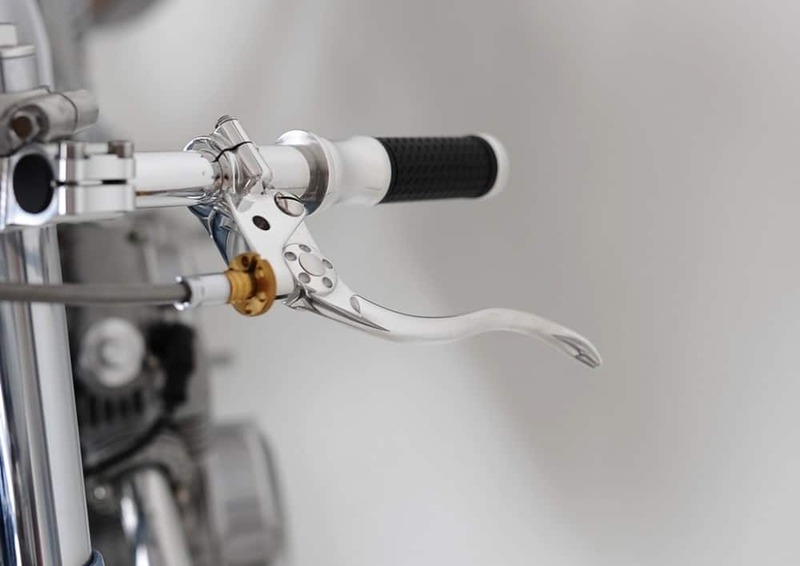 You could take it anywhere.Another interesting and relatively rare feature is the 3-position rearset bracket. 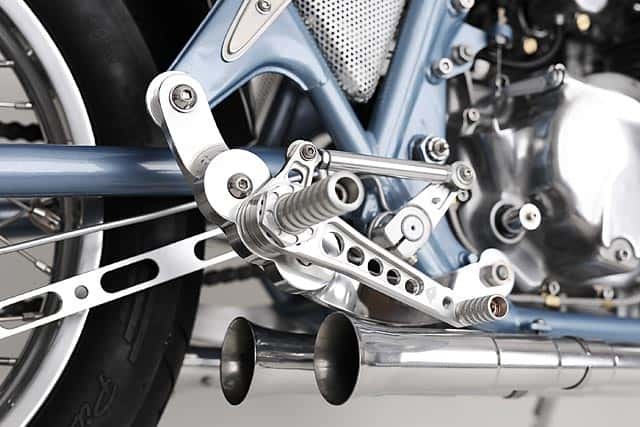 It allows the rearsets to be positioned up and down as well as forward and back to suit the rider’s size and preferred riding style. The most difficult part of the project was, completely unexpectedly, the frame. Modifying the tail section was easy, but grinding, filling and smoothing the original welds took a lot of time and effort and, in some cases, required tools that one would expect to find in a dentist’s office. Next was the question about color. The first choice of color was totally inappropriate, but I could only see what a big mistake that was after the bike was fully assembled. So, everything had to come apart again. The frame was stripped, re-blasted, re-powder-coated, and clear-coated. And then everything had to be put together for the second time. Luckily, the sky-blue color came out alright. 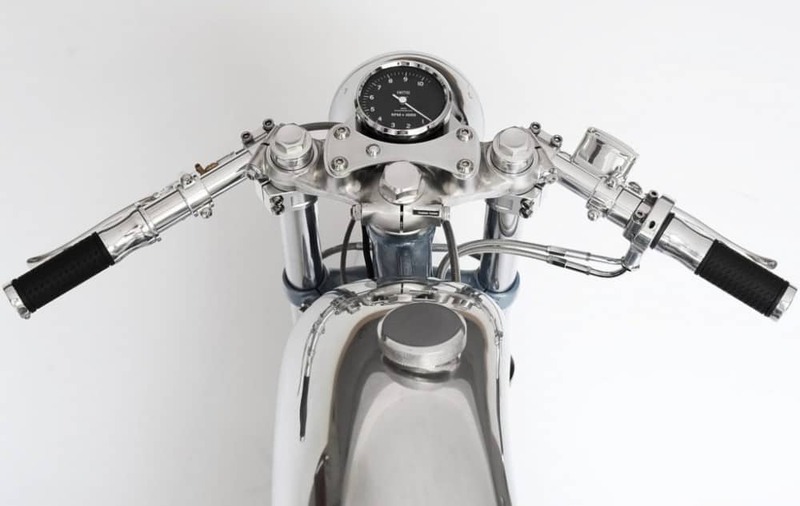 In addition to the main concept of exposing as much as possible of what makes a motorcycle “tick”, another objective was to lighten the bike as much as prudence and safety would allow. Yet a third objective was to avoid the use of plastic components as much as possible. There is hardly any plastic on the bike. Other than the battery casing, the fuse box and the tail light’s rubber-like elastomer, I can hardly think of any. 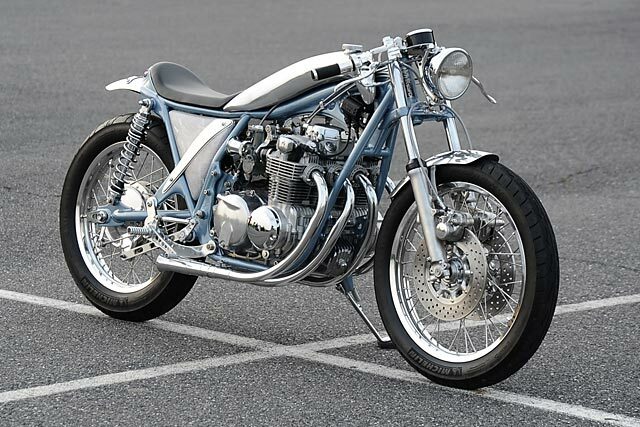 ENGINE: 1976 HONDA CB550. Bead-blasted, completely rebuilt from the bottom up, bored +0.5 mm to 59 mm (the original cylinder bore is 58.5 mm) and fitted with WISECO pistons (kit model number 40059M05900). Compression increased to 10:1 from the original 9:1 and displacement increased from the original 544 cc to 553 cc. Cylinder boring and valve job by TSI Competition Engines. CARBURETORS: original KEIHIN, model 087A, completely rebuilt. VELOCITY STACKS: one-off custom design, by STEEL DRAGON PERFORMANCE. FRAME: 1972 HONDA CB500, modified tail section, all original welds ground smooth. Powder-coated in sky blue and then clear-coated by TRICKED OUT CYCLES. FRONT SUSPENSION: original HONDA, rebuild with new tubes and springs. RIMS AND SPOKES: by Buchanan’ Spoke & Rim Inc. “Sun” rims in polished aluminum, stainless steel spokes. TIRES: MICHELIN Pilot Activ. Front 3.25 – 19. Rear 4.00 – 18. 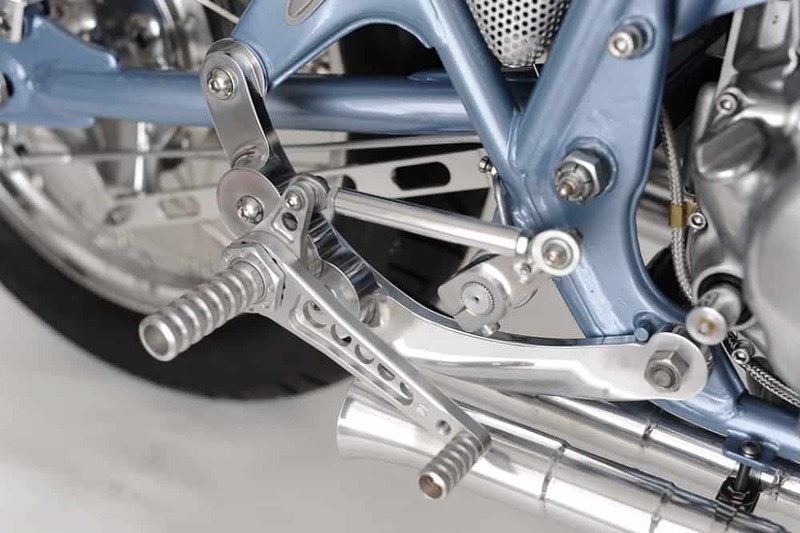 REARSETS: by JOKER MACHINE, model 09-800S, all aluminum, fully adjustable in all imaginable positions. 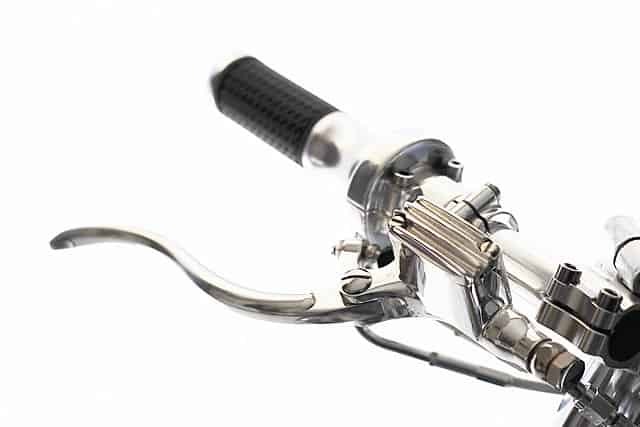 3-POSITION REARSET BRACKET: in-house design, allows 3 different positions for the rearsets depending on rider’s size and riding style preference. CNC-machined from 6061 aluminum. The brackets are approximately 12″ x 5″ x 2″ overall (roughly 300 x 120 x 50 mm). 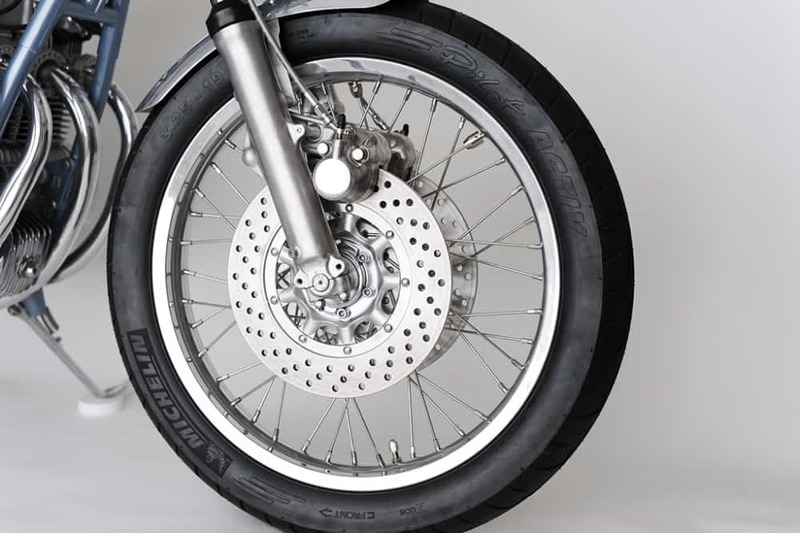 There are two curvatures which offset the mounting points by about 1/2″ (12 mm) and the three circular foot peg positions are themselves some 3/4″ (20 mm thick) allowing the brake pedal and clutch lever to clear the exhaust pipes. It took a big chunk of aluminum to CNC-machine these. HEADLIGHT: restored antique spot light (the bucket was chromed, the reflector was nickel-plated) fitted with a STANLEY lens. HEADLIGHT RELAY: common latch relay incorporated in the headlight’s bucket. TAIL/STOP LIGHT: 30-LED TruFLEX by Custom Dynamics. PUSH-ON MOMENTARY MINI SWITCHES for the headlight and starter button. 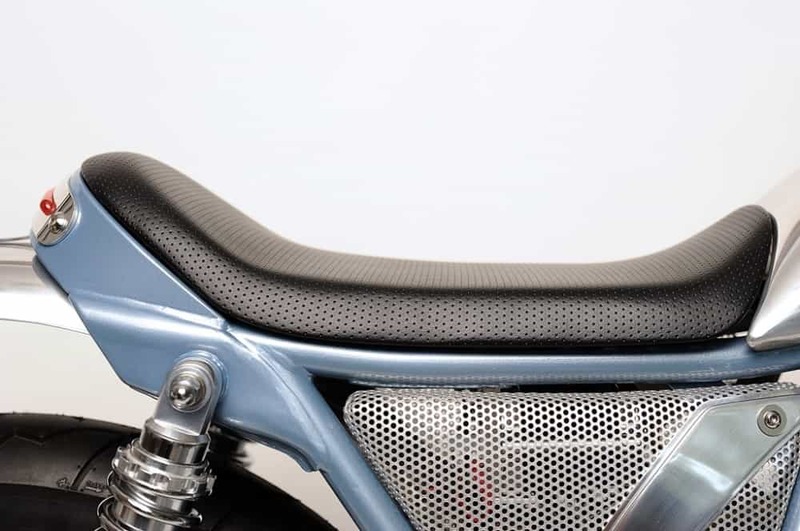 SIDE COVERS: perforated aluminum, designed and built in-house. 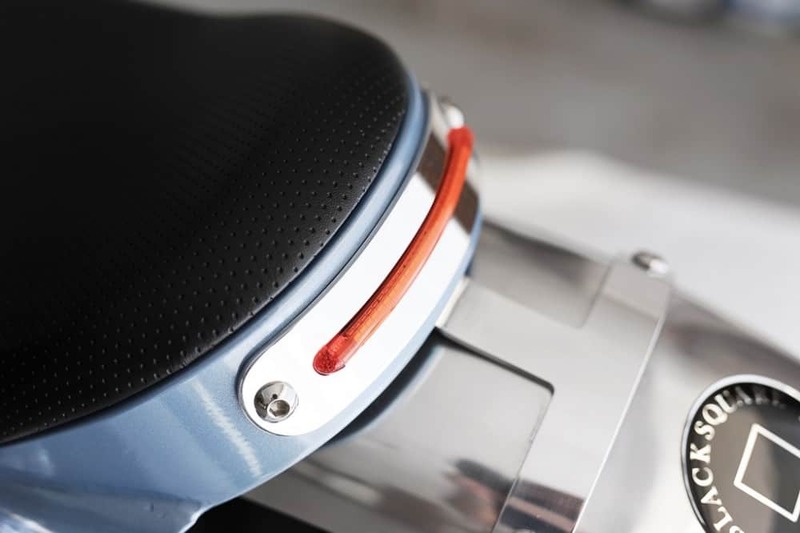 SEAT: designed and built in-house, aluminum pan, 1-inch foam, marine-grade semi-perforated black vinyl. All laser cutting by Keith Gayman. 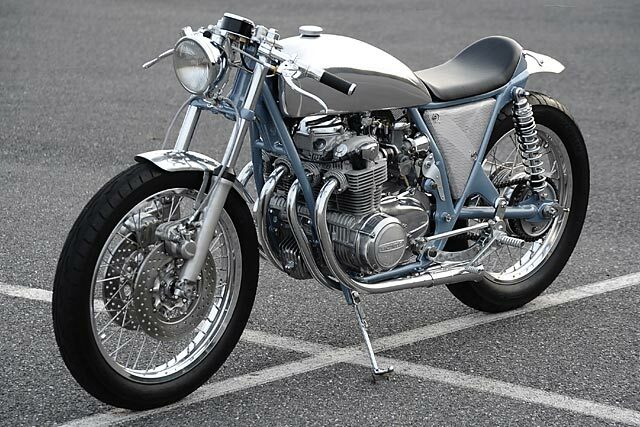 NOTE: The listed dry weight of an original 1976 HONDA CB550 is 423 lbs. (192 kg). 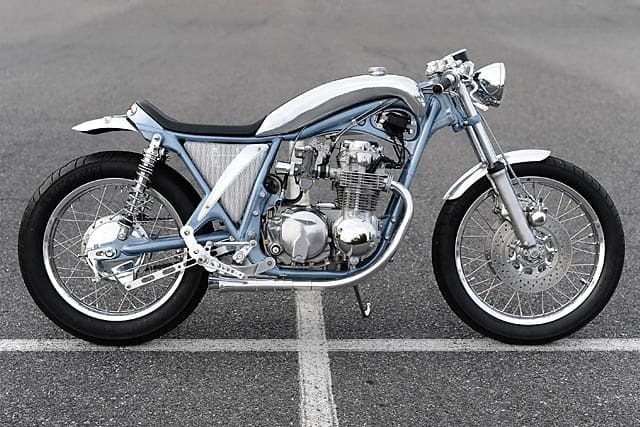 This entry was posted in Blog and tagged Bikini bike, bobber, brat, cafe racer, CB500, cb550, classic motorcycle, custom, four cylinder, hand built, Home made, Honda, Japanese Motorcycle 59 club, Kyril Dambuleff, Metal Art, rear sets, scrambler, tracker.